You could be inclined to think that this post is a belated April Fools but its not, and I am sure some literary aficionados might judge this post and that’s fine too. True, I don’t normally review childrens books, I leave that to the likes of my kind volunteers The Bookboy and The Girl Who Reads Too Much. Yet while I have been having ups and downs on the health front of late and been somewhat of an invalid I have wanted certain comforts and that includes childhood ones. In fact whilst reading ‘The Worst Witch To The Rescue’ by Jill Murphy I was eating vanilla custard slices so I really was going back to my ten year old self. ‘The Worst Witch’ series was one of my absolute favourite series as a child and so when I saw that the latest one, as Jill Murphy has brought the wonderful Mildred Hubble back a few times since the first book in the 1970’s and second and third in the 1980’s, in the library I simply had to pick it up. It proved to be the perfect comfort read and as the series was such a huge part of me becoming a reader I wanted to report back on it as it had me spellbound yet again. Mildred Hubble, to whom the title ‘worst witch’ refers to, is as the title suggests a fairly dreadful witch. Though when you say dreadful we aren’t referring to evil, she is just a bit hopeless. In fact her least favourite teacher Miss Hardbroom often refers to her as a ‘trouble magnet’. In this, the sixth and latest, instalment of the series ‘The Worst Witch To The Rescue’ the first day of a new term at Miss Cackles Academy for Witches all seems to be going unusually well for Mildred Hubble. Firstly she has managed to come up with a surprise summer project which is sure to impress Miss Hardbroom, who she knows is her sternest critic, she shows an incredible natural aptitude at a new subject and even her worst enemy Ethel Hallow seems to be being nice. Of course though this is the world of Mildred Hubble and nothing can stay that good for long can it? I can’t really say any more than that on the book as I wouldn’t want to ruin how it goes wrong for Mildred in case you decide to throw caution to the wind and get this yourself, which of course you should do. 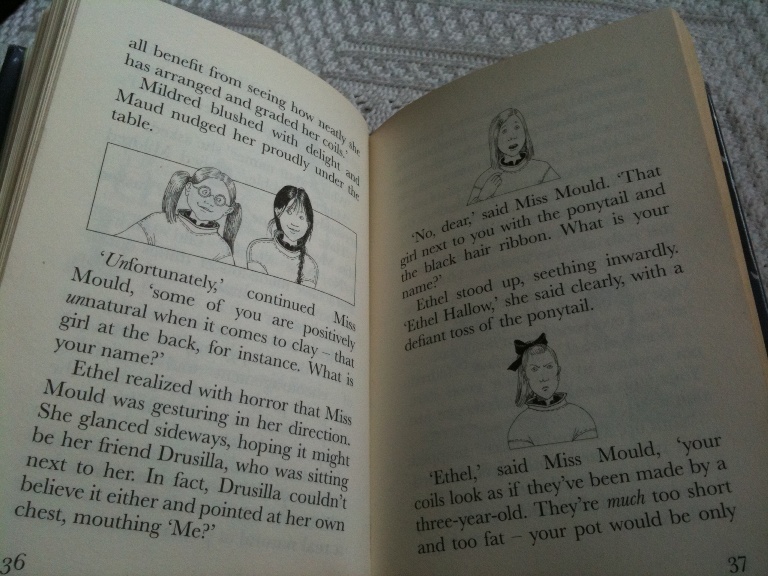 It was wonderful to be reunited with Mildred along with her friends Maud and Enid, plus her faithful feline Tabby and indeed the scary Miss Hardbroom and evil Ethel. It had me feeling like I did when I was much younger and wishing I too was a student at Miss Cackles Academy (the fact I wouldn’t have been able to be a witch didn’t concern me and hey its fiction anything is possible) and could join in with these gentle and enjoyable adventures. I also love the pictures, they evoke a love for the series and reading that I had as a kid. I took this book out from the local library. If I had been on the BBC’s ‘My Life in Books’ (or indeed the wonderful series that Simon of Stuck in a Book is doing which I loved reading) then I think it would be highly likely that I would choose The Worst Witch as my childhood book, even over Roald Dahl surprisingly. Of course this post isn’t just about how much I loved the latest Worst Witch tale; it’s about the feelings that turning to your favourite children’s books can evoke. Its also been nice reading some of this book to my littlest cousins. Have any of you read The Worst Witch series? Do you have a series that does this to you too and if so which one is it, is it still going, do you turn to it often?